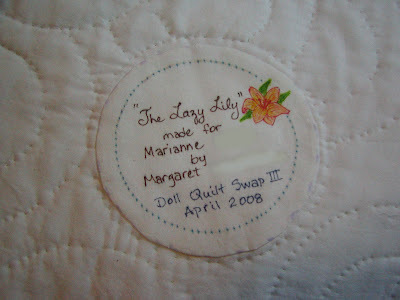 Marianne has received my DQSII Lazy Lily quilt, so now I can post more about it's making. I was really about to sweat (and curse & scream). It had been a week since I mailed it and still she had not received it. I have mailed to Europe in that amount of time. I thought for sure it was lost. I even spoke to someone at the post office yesterday about the remote site from which it was mailed (I incidentally had one other package mailed that same day also to somewhere in Michigan that had not arrived safely). It was starting to smell fishy. 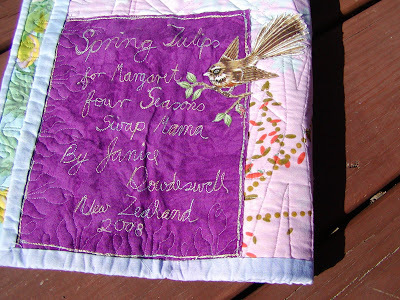 But fortunately, Marianne emailed last night to let me know the quilt was safe, and loved. The two words a quiltmaker wants to hear most. At the beginning of the swap, I anonymously emailed her since she does not have a blog. 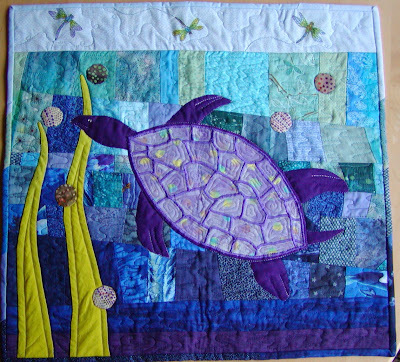 She sent me this picture of a quilt she recently bought for her bedroom as a potential source of inspiration. It reminded me of something southwestern, with the oranges and turquoise. 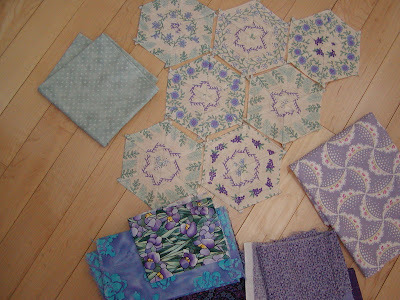 Immediately I thought of these fabrics which I used on this Round Robin border recently. I also remembered that on one of my duller afternoons I used some of these fabrics to "test" what the disappearing 9-patch pattern might look like. I made up this block which is about 15" x 18" or so, but really did not know what I was ever going to do with it. After seeing her quilt I knew exactly what I was going to do. Now generally when I do swap quilts, I make to order rather than having a stash of pre-made, unpersonalized basic quilt tops. Sometimes these can be nice. I have heard of people that make their swap quilts this way. I just choose not to so that the quilt is more personalized. But the fabrics were the right colors, and I had very little of them left in my stash. You see, the brown and turquoise (& it's combo) are not my standard colors. In fact, until I had recently worked with them, I probably would have just said I don't care for them. Actually, brown is still just for mud, but the turquiose is growing on me. What I needed to do was make the quilt have a focal point, a border & something more than a bunch of random, unpersonalized squares. 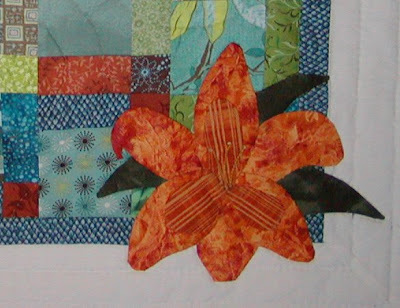 During the design, I called it a day lily. Lilies symbolize spring to me. They grow wild everywhere where I live - in the ditches, in manicured gardens, in hilly fields. Each flower lasts barely longer than a day, hense the name. 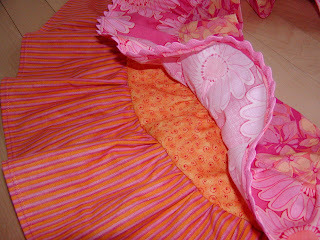 Besides, I didn't really know what else to add to the quilt that was orange. I am really pleased though that she likes and connects with lilies too. It is needle-turn appliqued on, with it's stamen (is that the right name??) appliqued on. It's leaves are a dark batik which matches the dark olive in one of the dotted fabrics. 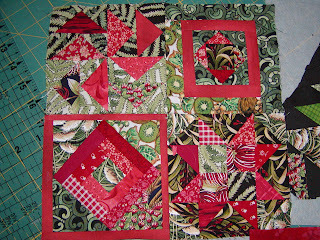 I added a wider ivory border around the disappearing 9-patches & hand quilted a couple rows of hand quilting. In retrospect, I wish I had done a couple more rows, but then. I like the center part of the quilt which is hand quilted in concentric & overlapping circles. You can sort of see the quilting in the picture of the label I put on the back, also a circle. The lily on the label is drawn on using permanent sharpie pens. They are just wonderful! The recipient says it coordinates with her bedroom & new quilt very nicely, and that is all I needed to hear. It is definitely nerve-wracking making something for a person that hasn't a blog so you can at least get a sense of their style & likes. I have hesitated to show too much about Lucky the Turtle (OK, get your head out of the gutter!) because it is going to my Miniature Booty Swap partner. But I really don't think that she has been to this blog so I'll post some finished shots. I need to afix the label, but otherwise he is done. Here is the top. 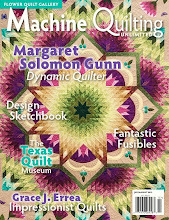 I don't profess to be a machine quilter. I generally hand quilt, and am happy doing that. 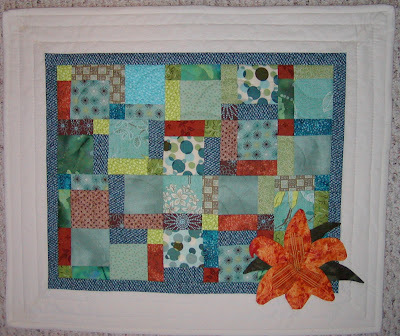 I also typically do more traditional pieces where hand quilting looks appropriate. I thought this was an opportunity to work outside of my comfort zone, and practice the free motion quilting a bit. 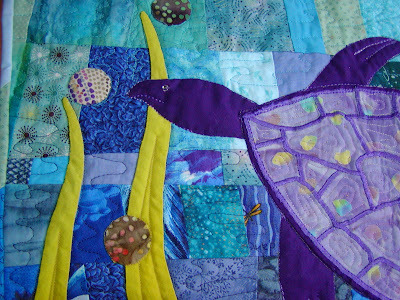 The turtle's back was satin stitch zig-zagged before I hand appliqued it onto the background. I didn't want to see the satin stitching on the back of the quilt. I free motioned inside each of the shell's pieces. Very tedious!... I did a tripple-stitch in a satin rayon variagated purple thread around the entire turtle & gave Lucky a simple glass bead eye. Voila! The circular bubbles are out of some of my all-time favorite spotted batiks. I have barely more than what I used on the quilt left in my stash. I think they give a nice effect. The dragonflies are hand drawn and then heat-set using sharpie pens. The little bit of pale blue embroidery was not planned, but it's there to cover up where I thought I wanted to draw the trails of the dragonflies. I decided the blue lines in pen didn't look right. The back is scrappy from a number of my watery or fishy fabrics. So, my original question...Will you get Lucky?...the quilt that is! I have used foundation paper to accurately piece some curving flying geese. This is my first experience with the stuff. I am supposed to tear it away, right?? It seems to be loosening the seams when I do this because I have not back stitched. Help!!! Yesterday I attended an annual Project Linus Make a Blanket event in my area. I was easily the youngest person there, but it's a great day of fun, happy quilters. I dug out 2 of my unfinished tops to sandwich & bind. My mom and aunt came too, and I knew they wouldn't bring projects so I was able to put at least one of them to work for me! Here's one of the lively tops that is now a finished quilt. The other is here, although this is not a finished picture, as the quilt is already packed away downstairs. One of the other tremendous perks of going to the Linus events is that there is usually free fabric, and copious amounts of it. I was able to get many, many pretty pieces of at least a quarter yard, some as much as a couple yards, 2 pieces of red (from Red Cross) fleece that are for a king sized bed - probably 15+ yards of fabric not counting the fleece. It's fun to supplement the stash for free! A week or so ago I got a bit of fabric (I know, shame on me!) from Ebay. It's mostly batiks and Kaffe large prints - drop dead gorgeous, but the larger prints are challenging to work with for me. 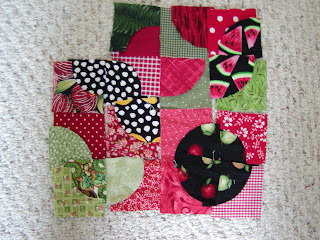 Here's part of a mini-quilt top that I will pbobably not use for a swap. It's more just a fun play with color, but I don't think it's my partner's taste. So here is onto my 3rd try at a quilt for Kate's ALQS. Without giving away too much info about my partner's likes, dislikes & style, I am trying to do something unconventionally, traditional (if that makes sense), in simple colors (or not too many), yet modern fabrics. Several of the ones I have used came from the AWESOME little packet of squares Janice sent me with this. They are leafy and swirly and I just love the little kiwi's (she's from New Zealand). It was kind of hard to use them to make something for someone else, but they do look good. It kind of reminds me of a frog in a blender, but I will probably need to come up with a better name! I'm going to use some of these too. Not sure of the exact placement of the curves yet. And some curvy paper pieced flying geese. How fun! A little skirt in some fun, flirty fabrics for my daughter. I made the pattern so if anyone is interested, let me know. It's not hard, and doesn't take a ton of fabric. Once I get the elastic in the waist, I'll take a shot of her in it. 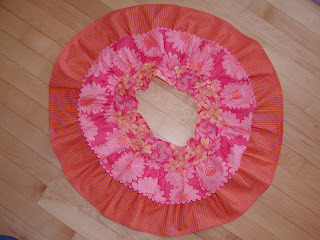 She loves to twirl in circles, so I knew it needed to be a full circle skirt. At 20 months she couldn't care less that we can see her undies! The rick-rack remindes me of more flower petals. 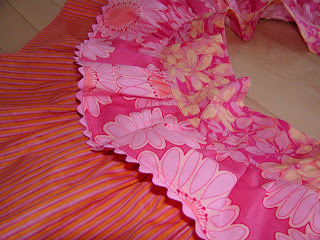 And when the ruffle flares up, there is fun orange swirls underneath. I was lucky enough to inherit 40-50 quilt books and old quilty magazines from my aunt, who is clearing out her sewing room. These are awesome. Mailed my Doll Quilt SwapIII to somebody. I'll post about this quilt after it is received. Lucky got his binding. I'll show pictures of him soon enough. He's quilted now obviously. I am also pushing away with my Amish star hand quilting. It's nearing the half-way point. 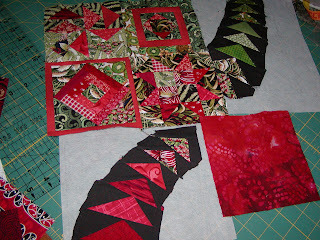 doing all the fun (ha ha) quilt tracking for the 4-Seasons quilt swap which is nearing it's shipping date. For those of you that opt to leave comments, thank you. I love to read them. Even if I do not respond or always comment myself, I do enjoy snooping at what everyone else in the quilt world is doing. It is a source for wonderful inspiration. Thanks for all of the terrific suggestions of what to do on this border. I really nearly went with a pastel color, but then quickly caught hold of my senses. I think I really like the dark blue (actually it is 2 dark blue fabrics progressively deeper towards the outer edge). I did use a little of the dreaded pink to put a small stripe across the top edge of the flower pot. It seemed a little hypocritical of me to put down the "rules" of the round robin, and to then just ignore them when I didn't like what I had to play with! 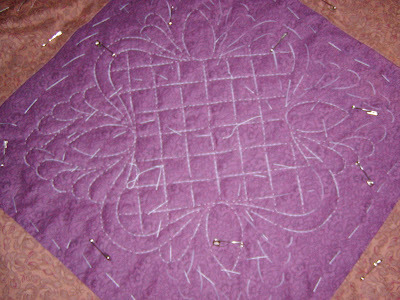 I am not finished with it - I need to experiment on another piece of fabric with my trapunto quilting. I may either embroider some tone-on-tone ferns or swirls into the pots or do the swirls in trapunto quilting. The person that does the quilting on this block can just avoid where I have done the trapunto. I have only done trapunto by hand so I need to play with my machine a little. It's not as bad as I thought it'd be, but I don't love it either. Here's something I played with this afternoon also. ...little kaleidoscope blocks. For what?? Not sure yet. My 1/4 yard of this fun stripe fabric only made 7 of these 4.5 hexagons. For all of you out there in support of those nasty pastels, here's a few options I sketched up. Thoughts?? ...and remember, I am supposed to work in some of the pink that was sent to me (used on the corner squares), but I just cannot figure out how to incorporate it! Note that the triangles in the baskets are NOT done in pastels. They are dominant jewel tones, as this is what Laila used (all but the soft blue). All comments welcome. I posted a picture of one concept I have sketched up above. My thought is to make the last border darker to help ground the block and settle it's busy nature. I tried to make the 4 corners look like little flower planters. 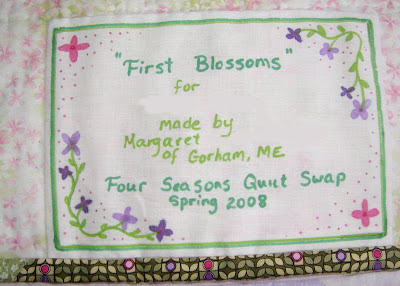 I may consider embroidering flowers there too, but that is not decided yet. Laila sent me that lovely Pepto pink that I "should" incorporate a little of into the border. But how??? It was a very lucky mail day. 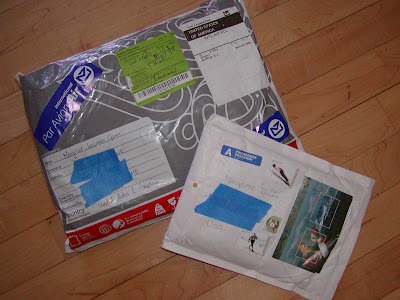 Not one international package, but two!! 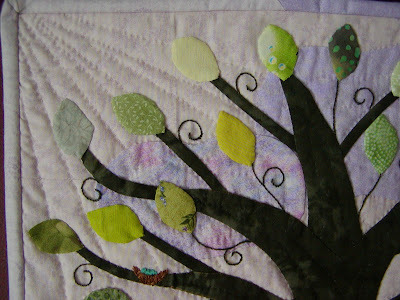 My Spring Fling round robin square arrived from Laila, and my Four Seasons Spring quilt. I was riddled with excitement, as I tore into the packages. 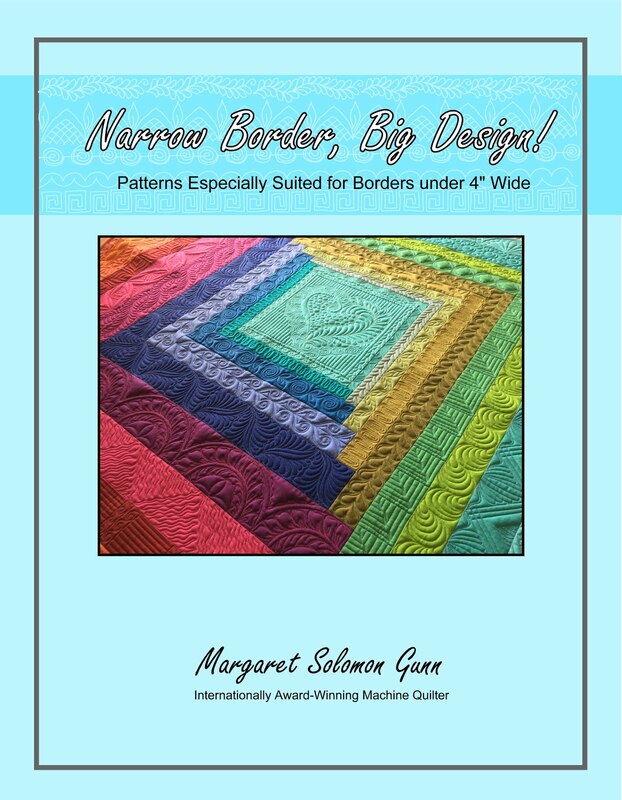 The free-motion quilting around the border is incredible as is the rest of it. It's raw-edge appliqued, which is something I have never undertaken. Like myself, she apparently has an enormous stash of green fabrics! It's so marvelous, really beautiful. It's my take on a more modern looking Amish quilt...uses simple dark jewel-tone prints and batiks. This is the 3rd of my Legacy Quilts. There are three in all, made for each of my kids to someday have. They are completely different styles, but all share similar fabrics. One is complete and hanging in the living room. The second is all pieced and partially quilted. This is like whole cloth quilting and is very relaxing. I recently got several large stencils for if from here. I highly recommend them - great selection and good price. The heart is a 2' x 2' for our nanny's anniversary. And to just say thanks for being so great. With my school year coming to an end in 3 weeks, I don't know what will happen next fall. Sure hope she's free!! This is scrappy pieced, and I practiced my machine quilting, which is definitely getting better. 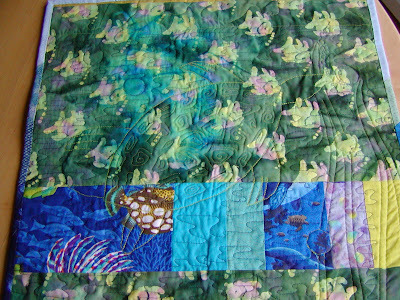 Here's one of my swap quilts. I have several swaps in the works right now so I won't sway exactly which it is for so as to tip off the new owner. I had pieced the disappearing 9-patch of the quilt a month ago, and just put it aside. After learning of my partner's likes & requests, I decided it'd be perfect for her once finished. She likes these colors. The fabrics are a little funky & retro too. I added the "Lazy Lily" (as it is named) for a burst of orange color. 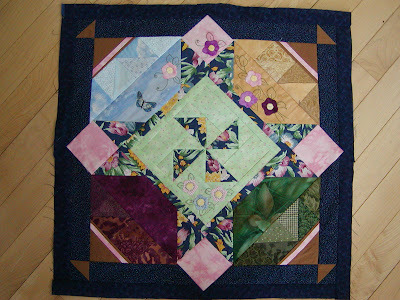 It is hand-quilted in overlapping concentric circles in the center. The ivory backing and use of sage green quilting thread makes the circles show up more in reality than they do on the picture. I'll show the label and more about this quilt in a few weeks once the partner receives it. There's a few other things on my sewing table too, just too dull to photograph! I'm sewing 28 feet of binding on my middle son's new bed quilt. UGGH! Boring. 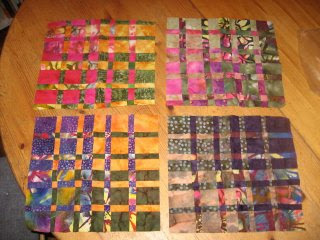 I am playing with a couple little quilts made from some Kasse Fasset squares. The colors and fabrics are wild - I love them. One of these will likely be for Kate's ALQS. I have time still as it is not due until July. 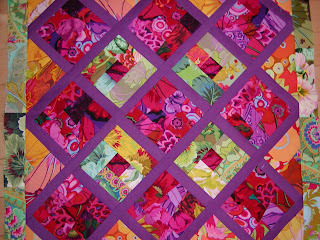 I am brainstorming my next border for the Spring Fling round robin. 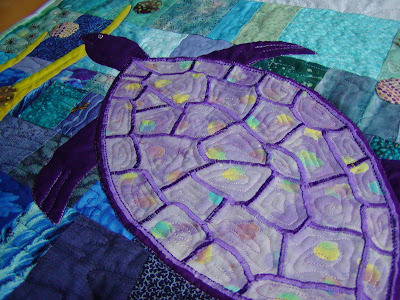 I am contemplating finishing the Lucky Turtle quilt. I think he just needs a binding. I am about to start a quilt for my son's kindergarden teacher with artwork by each student. This will be very fun; I'm excited. Have to gather the last 6 pictures though this week. I am sure there are more, but I need to finish a few of the WIPs first!! 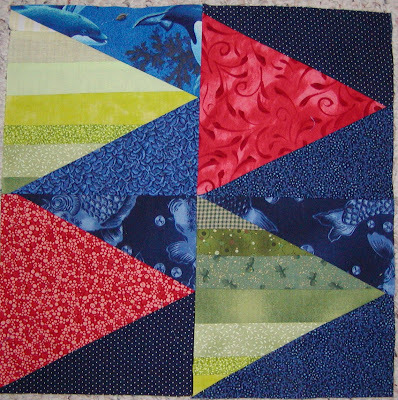 This block is due to arrive late this week from Laila. I must add a border to it so that it is taken from a 13" block to a 20" block. Here's a closeup of the block center. I am jumping the gun here with trying to brainstorm out a good design. Any Ideas??? 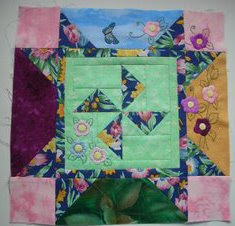 A piece of the pink like the corner squares and scraps of the blue floral are coming with the block. Additionally, I can select my own fabrics too. It is for the Spring Fling Round Robin. I have been wanting to write a segment about bindings for some time now. It is probably one of the most understated items on a quilt, but a very important one. Nobody will ooh and aah over a quilt because of it's binding, but a bad binding will sure draw one's attention away from an otherwise very nice quilt. Now I don't proclaim to be an expert at bindings, but over the last few years, I have managed to figure out a few things about bindings (largely from making mistakes & learning from them). 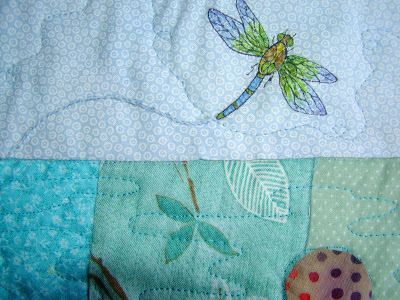 There several ways to "finish" off the edges of a quilt; a binding is just one of them. For the sake of this lesson, let's ignore things like zigzagging the edge or turning the quilt inside out, and focus on just "bindings" in the classical sense. I know of a couple of methods for bindings, one of which is used more commonly. The French Fold or Double Fold method is what many people like to use. 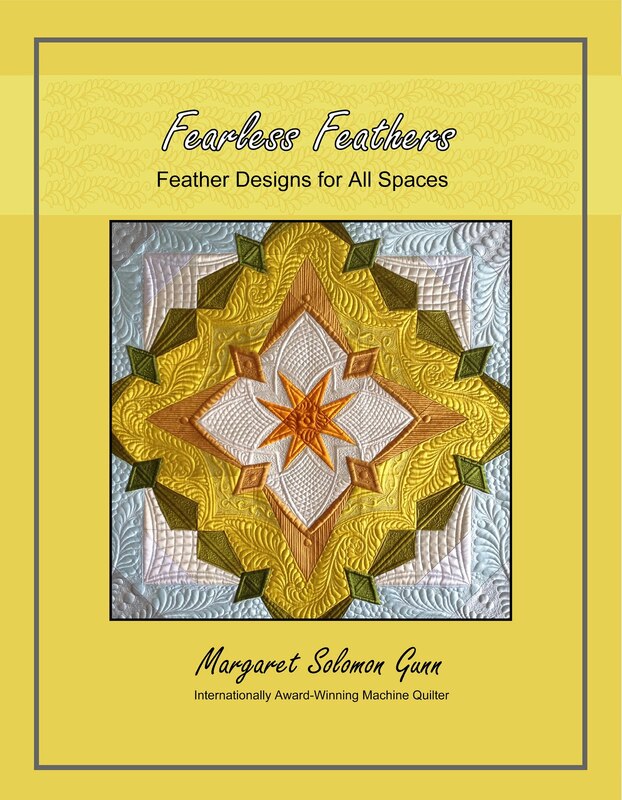 It is usually made from 2 1/4" strips, either straight cut or bias cut, pressed in half, sewn around the periphery of the quilt, and finished most commonly by hand on the back side. This link is one I found last year, and like. The photographs are very clear, as is the instruction. Here is another particularly attractive binding tutorial by Heather Bailey. This one shows how to clearly connect the two ends of the binding so as not to have that unsightly lump at the seam, an additional plus for a good binding. 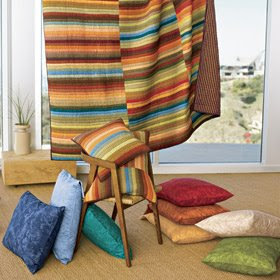 Furthermore, her fabrics are marvelous so have a look! I used to be guilty of doing a single-fold binding because I thought in the end it saved fabric. It does, but the double fold is much more durable if the quilt is going to be used, gives a nice firm edging, and eliminates the need to turn under the binding edge before sewing it down. Do yourself a favor...Use double fold! You will be happier in the end. Pay close attention to how the corners are done, as this is the only real hard thing about the binding. Once you can make binding corners as shown in the two links, you are golden! Take the time and practice because this corner style is WAY nicer than piecing the four binding pieces separately and having seams all over the corners. 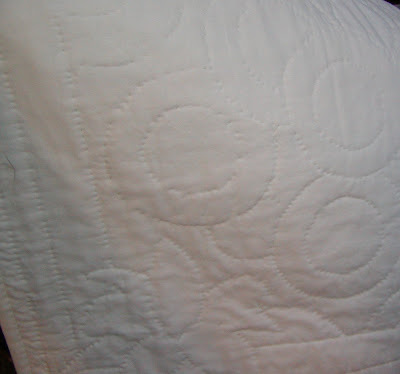 Looks better, plus it is one less place your quilt may tend to fall apart with repeated use and washings. The convention does seem to be a narrow, tight binding, but play with this. I, personally, often use 2-1/4" strips for double fold binding as this uses the least amount of material, but I like them a little wider too, say using 2-3/4" strips. The wider binding on the finished quilt tends to pull & twist less because you have not "pulled" on it to make it so tight. And lastly... when sewing the binding pieces together, the strips should definitely be cut on 45 degree angle to minimize the bulk - if you chose not to make a continuous strip of binding. Another one of my pet peeves about bindings are when they are machine sewn down on the back of the quilt. The machine does a great job putting the binding ONTO the quilt. It does a horrible job stitching it to the backside of the quilt. You can't see the other side while machine sewing! This is where the time-consuming hand-stitches are a MUST. Machined bindings are ugly and never look as good as the alternative. You have taken all this time to design and sew your quilt and either hand or machine quilt your quilt...take a little more time to hand finish the edge of the binding. 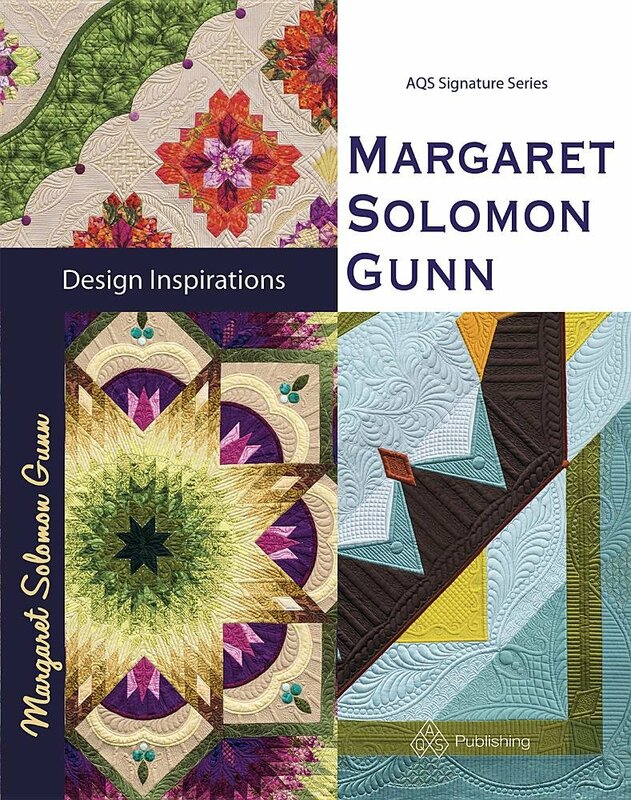 Bindings are that one last place that you can invoke a little style to your finished quilt. I have seen lovely little striped bindings and the especially fun scrappy pieced bindings. 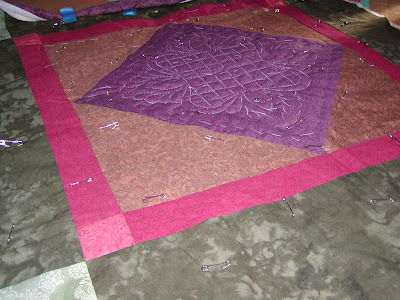 A nice dark binding will help to ground the edges of the quilt to the eye. 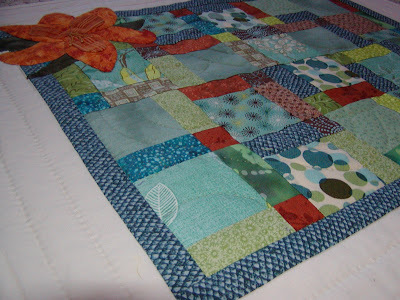 I also am a huge fan of a binding that blends right into the edge of the quilt because it is the same fabric as the border onto which it is sewn. Each has it's place on certain quilts. 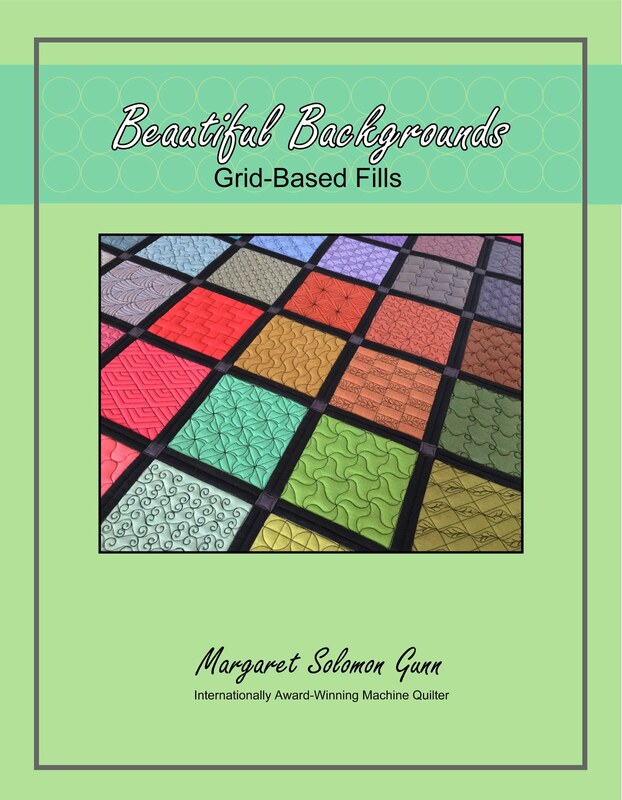 Experiment and play with the colors to know and learn what will work best for your quilt. One other possible type of binding is to make an invisible binding as seen here. I have never made one of these as I usually like the look of a traditional binding, but it is an interesting idea. There is a nice example of an invisible binding from Luisa here. And lastly, if you like something totally different, try a Prairie Point border. It's fun, perhaps more time consuming, but a great way to use up those scraps! That's my opinion...I welcome your's! Please comment for me what you like to do for bindings, any favorite binding links and tips. I look for the inputs! The fab Kate is hosting a mini-quilt swap. She does absolutely wonderful work. If you are creative and interested, visit this blog for details. I was overwhelmed with sadness as I mailed my Spring quilt last week. I think it was mostly just the anxiety over spending 60+ hours making something that I was about to entrust to the Postal service to transport 3000 miles. But oddly, in the swaps I have done this last 9 months, there HAVE been items lost. I really did not want this to be one of them because there would not be a replacement quilt of similar content! This was a very fun project to make. 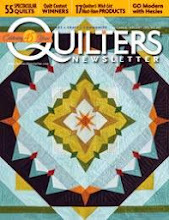 I knew I was making it for a very deserving person, and a very good quilter. 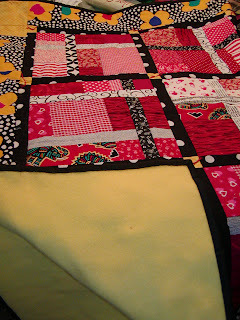 Now that Tami has received the quilt, I can show a few additional pictures and reveal a little more about it's making. Here's the finished quilt, about 17"x21" I think. I started by making 36 of the little hand appliqued tea-leaf squares. 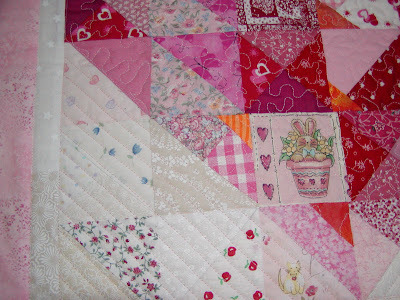 Initially I planned on making another quilt very similar to this one that I made for myself this spring. As the sign-ups for this swap continued, and I realized I wanted Tami for my partner. I decided too that I wanted to convey a paler shade of spring than the deep tones of the tea-leaf flowers. Additionally, I decided that I needed to go a little more unique and original for her. She's got a very creative mind, and deserved my best at an original design. Her experience with her last swap was not stellar, and I think she nearly did not sign up for this one because of that. I hoped to rejuvinate her trust in the unknown. 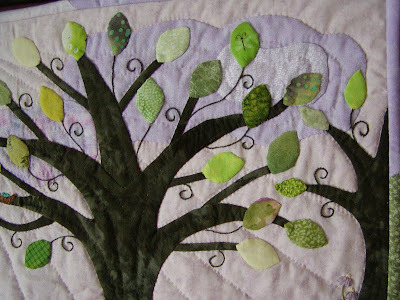 When I began the quilt, it just had the larger center tree. Thanks to my crappy old iron, which left a small scortch mark on the very soft, and pale lavendar background, I had to concoct something to cover it up. With the finished quilt, you cannot even tell what had happenned. I have even nearly forgotten it myself! But I remember the day I saw the orange mark and I nearly cried! 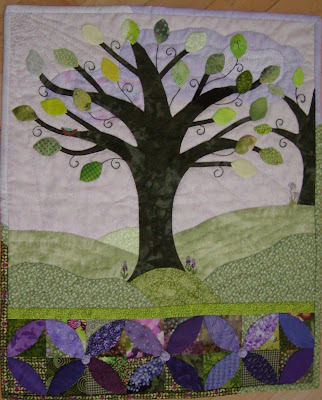 The tree still had no leaves, but I knew it was a lot of work to replace it, and I had no more of the lavendar fabric I used. 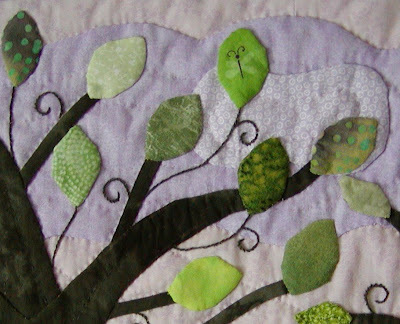 The entire quilt is hand appliqued (needle-turn) except for piecing the 16 tea-leaf squares together and sewing on the binding. I still cannot always sew my curves without something "wompus" happening (my own word for unruley streaching! ), so I just do them by hand. Almost all of the leaves are of separate greens from my stash, with my favorive being the little dragonfly leaf. Just a little whimsey! I know I showed this as my initial inspiration some weeks ago. It's a kind of gaudy little metal tree I have, but I love the swirls. So I embroidered them onto the tree. 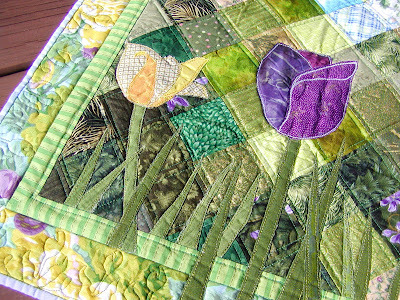 I added a few embroidered flowers too - it is spring afterall, somewhere! Here in Maine the snow is just disappearing. Flowers are at least a month away still. Where the little nest sits was a joint of two pieces of fabric that I had to cover up. I thought the robin's eggs and nest was such a springy cover for my blunder! Hyacinths are one of my favorite flowers so I wanted to add some of them. I'm not sure if California really grows many of the bulbs, but then. I went to grad school in CA, but I wasn't really looking at the flowers much at that point in my life (too busy trying to eye a husband!)!! 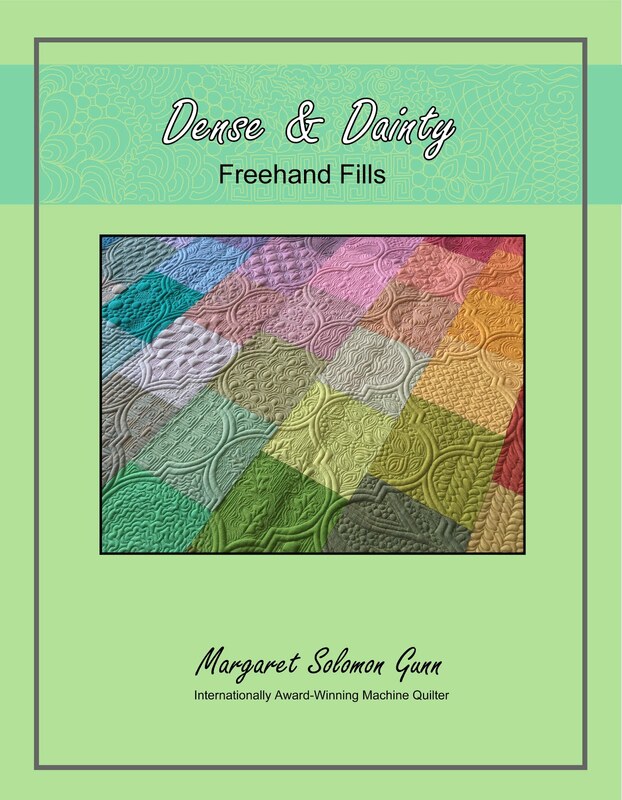 Although I am practicing my free-motion quilting more lately, I consider myself to be a hand-quilter. 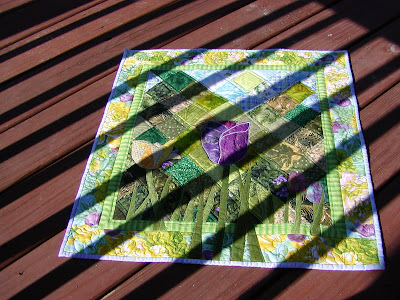 This quilt is completely hand quilted, in lavendar and green threads. I just live quilting the background fabric - it is the softest cotton and the needle just slides through as it is stitched. 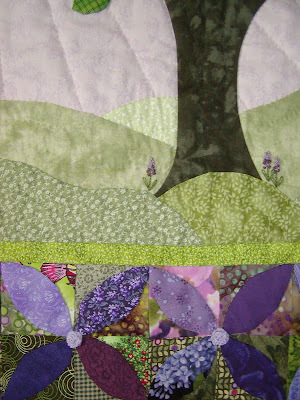 In the end, I love that the clouds are in shades of purples, and that the quilting resembles rays of sunlight. To me, it is quinticential spring. 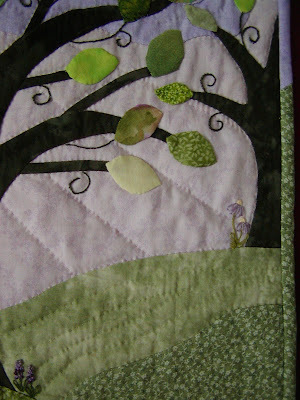 So my finishing touch was adding a row of te tea-leaf flowers at the bottom of the quilt. I hated to make all of them and not use any. They are all from the many greens and purples of my stash. The funny thing here is that I actually comtacted Tami to inquire how she made the yo-yo centers that she used on her Spring Fling center block - I wanted them for the centers of these flowers! She gave great instructions, which I later posted here on my blog. It only took me 5 tries to get 3 of them that were close to the same size. 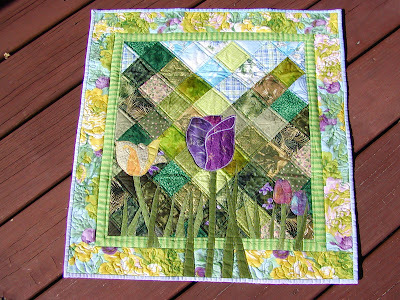 I am anxiously awaiting (and being a perfect swapper and not looking at her blog) my spring quilt. I know where it is coming from obviously, but do not know what magic she is putting into it. These arrived in my wet, soggy mailbox today. Good thing it was not my tax refund!! ...or perhaps I should just be thankful it is 38F and this is RAIN, not that other nasty stuff that falls from the sky! Anyhow, many thanks Kate!! I am already brainstorming as to what I will make from them. The batiks are simply devine! The making of this quilt is shown here and here and here. 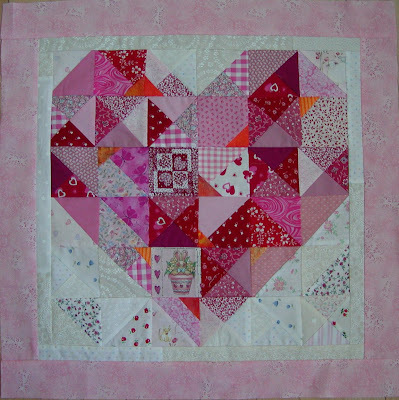 I have rejoined the quilt block swap. Here's my April "nautical & scrappy" block. Hopefully my partner is not snooping this out! Those are supposed to be like the triangular flags on sail boats.